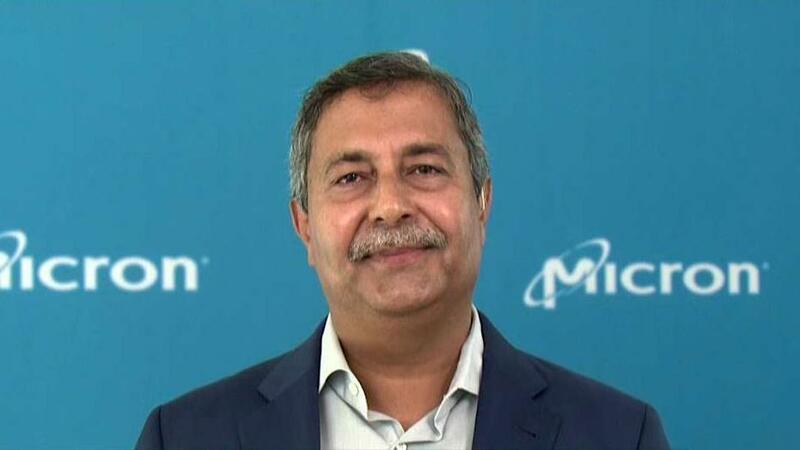 Micron's revenue and gross margin fell Q/Q. DRAM pricing and demand are eroding. The truth hurts. Sell Micron stock. I have been bearish on Micron (MU) for some time now, predicting a slowdown both in its top line and in the global economy. MU bulls have been buoyed by the fact the stock has held up rather well, despite my bearishness. It is down only 19% Y/Y - I had expected MU to free-fall. However, the stock has benefited from a melt-up in broader markets. Over the past year, the S&P 500 (SPY) and Dow Jones (DIA) have risen 9% and 7%, respectively. Tax cuts and low interest rates have aided the markets, but how long can it last? Broader markets will fall eventually, and so will MU. 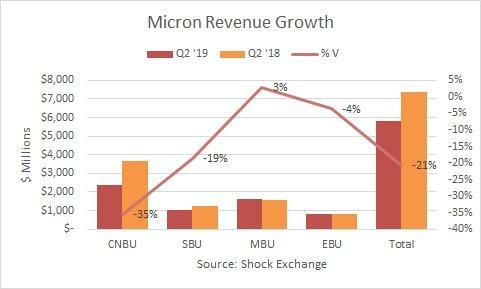 In Q1 2019, Micron's revenue was up by double digits Y/Y, but fell by 6% sequentially. This quarter, it was clear the slowdown was real. The company's revenue of $5.8 billion fell by 21% Y/Y and 26% Q/Q. Gross margin declined by 900 basis points compared to the year-earlier period. This caused gross profit in dollar terms to fall by over 35% Y/Y. The company has shifted revenue from components to high-end solutions with higher growth potential and higher margins. That narrative may have ended. Revenue from the Compute and Networking Business Unit ("CNBU") fell 34% Y/Y. The decline reflected inventory corrections and CPU shortages, which hurt prices and volume in the segment. Since CNBU represents over 40% of Micron's revenue, its diminution could continue to weigh. Revenue from the Mobile Business Unit (MBU) rose 3% Y/Y, yet fell about 27% sequentially. The sequential decline was due to seasonality and weaker demand for mobile devices. This countered share gains in mobile-managed NAND in previous quarters. The Embedded Business Unit (EBU) fell 4% Y/Y on weakness in the automobile sector, weaker pricing and lower volume in DRAM. I have been bearish on sales into the auto sector, and my thesis could be bearing out. Meanwhile, revenue from the Storage Business Unit (SBU) was off by double digits again due to pricing declines. On a product basis, DRAM revenue fell 28% Y/Y and 30% sequentially as average selling price (ASP) declined in the low-20% range compared to the prior quarter. The declines could be based on supply and demand. However, in the past, customers may have stockpiled products related to DRAM in order to lock in prices. Pricing could be hurt as customers work through those stockpiles. DRAM represents over 60% of total revenue; continued price declines could now drive the narrative. NAND revenue fell 2% Y/Y and by double digits sequentially. NAND ASP fell in the mid-20% range; and shipments increased, which slightly offset the fall-off in ASP. With pricing for both DRAM and NAND products in decline, Micron could be running in quicksand. The company can cut down on bit supply in order to offset price erosion, but that may not help its top line. The free fall in revenue and gross profit remains a concern. Who is to say gross profit will not continue to fall, despite attempts to manage supply growth of NAND and DRAM products? That said, Micron has about $7.6 billion of cash and securities on hand. This level of liquidity could give MU bulls comfort that the company could weather further downturns in the market. Cash flow from operations through the first six months of the fiscal year was $8.2 billion. This level of cash flow is robust. It will likely fall with the decline in earnings. However, strong cash flows imply the company can continue to add to liquidity in the future. With that in mind, our non-GAAP guidance for the fiscal third quarter is as follows: We expect revenue to be in the range of $4.80 billion, plus or minus $200 million; gross margin to be in the range of 37% to 40%; and operating expenses at approximately $785 million, plus or minus $25 million. Based on a share count of approximately 1.14 billion fully diluted shares, we expect EPS to be $0.85, plus or minus $0.10. Forward guidance implies earnings could continue to fall hard. At the high end of management's range, revenue would be about $5.0 billion, down 14% sequentially. Gross margin at 40% would imply gross profits of $2.0 billion, down about 30% sequentially. MU bulls have seen this movie before. Nearly three years ago, quarterly revenue was below $3.0 billion and gross margins were sub-20%. Some would refer to management's prognostication as "weak guidance." I believe management simply told the truth. Given an apparent slowdown in the U.S. economy, Micron's growth may not pick up anytime soon. An inverted yield curve implies low growth and low inflation. This could be as good as it gets for MU and the economy.